This is the newly released 3rd generation Tiarra grille! This is the ultimate way to fix up your vehicle and make it look like a new deluxe, high-end model. If you are out looking for the best, the top of the line; YOU HAVE FOUND IT. USED ORIGINAL GRILLE EMBLEM FROM A 1977-1979 CHEVROLET IMPALA. THIS IS A USED ORIGINAL PART, WILL NEED RESTORATION TO BE NICE AGAIN. SOLD AS IS. 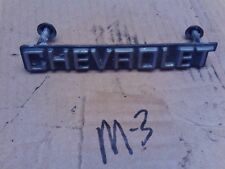 I BELIEVE THIS MAY FIT 1976-1981 CHEVROLET CARS BUT I CANNOT VERIFY. LOW PROFILE. UNION, NJ 07083. BiggDaddyCaddy LLC. High Grade Stainless Steel. Enhance the style or function of the original OEM grille. U.S. (Upper - 48 States). Condition New. Those are the best places to have it installed. Keep in mind, we do not make the products. Up for Sale is a Grille Chevrolet Caprice 1979 P/n:GM 14005678 LOC 746147 OEM USED. This is very popular in the automotive scene. NOT to replace your factory grille, it is simply an insert to change the current look of your car because this grille is simply an overlay. YOU NEED THE FACTORY GRILLE IN THE PICTURE FOR THIS KIT TO WORK! First impressions count! PO BOX, AK, HI, PR, GU, VI, APO, FPO. U.S. Lower 48 States. (For Polished Grille). Insert billet grille might involves taking off the factory grille, but cutting work is not required. Air craft grade 6061-T6 aluminum solid billet grille insert can protect the front end of your vehicle. Front Grille - 10220509. We work hard to keep mistakes to a minumum but they can happen. DO NOT INSTALL! What do I do?. We are a division of a large corporation that has locations in many states. We appreciate your understanding in these situations. Features: ---High quality, fade-resistant and brand new ---Aircraft grade 6061 aluminum billet grille ---ISO 9001:2008 Certification Information: ---Type: Main Upper Grille Insert - Horizontal Style ---Color: Polished ---Material: Aircraft grade 6061 aluminum ---Mounting hardware included: Yes ---Fits 1991-1996 Chevrolet Caprice ---Installation Method: Replacement (cutting required) ---Quantity: 1 piece. We will do our best to resolve the issue and make sure that you're 100% satisfied! And rear bumpers, deck lids, doors for 1960-1976 Impalas. Part has normal dings and small dents or imperfections, surface rust from being 40 years old and not painted in decades. I am CRABBY MATTY'S IMPALA PARTS. I specialize mainly in FullSize Chevy. 1991-1996 Chevrolet Caprice. 6:00PM 9:00AM. General Policies. CHEVROLET CAPRICE 1991-1996. MAKE MODEL YEAR. MANUFACTURER PART NUMBER. Cutting and drilling will likely benecessary. Requires complete removal of your original manufacturer grille for installation. This will be a permanent modification. not be able to use your original grille after removal.